Pristine! One Floor Living at its Best! Nestled privately w spectacular views of Blackheath's 11th Fairway. 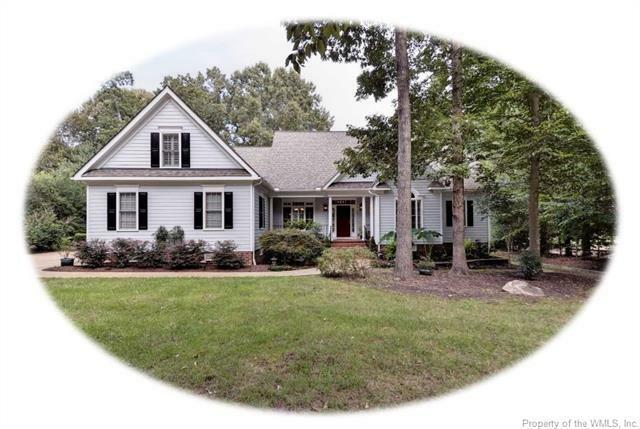 3000 SF gently lived in, 4 Beds/3.5 Baths(or 3 beds and a bonus rm with Full Bath)FR/DR/LR/ 1st floor master suite w 2 spacious walk in closets, soaking tub, glass shower double sinks, access to screen porch for morning coffee! Gourmet eat in kitchen-stainless GE Profile appliances, cherry cabinets, double convection oven, gas cook top, granite counters. Opens nicely to great room w gas fireplace; formal DR; LR w cathedral ceiling (or office) w double glass doors; 2 additional beds on main fl; bonus rm with Full bath! Screen Porch, trek deck, concrete stamped patio, custom landscaping, Generac 17 KW generator(2011),Plantation shutters, Hunter Douglas remote control black out shades in bedroom, 75 gallon water heater w circulation pump, RUUD gas furnace w humidifier, additional R30 insulation and R19 in floor..too many extras to list! Come see, you have found home!